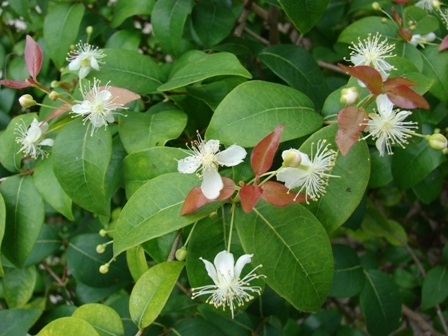 Synonyms: Eugenia brasiliana, E. michelii, Myrtus brasiliana, Myrtus brasiliana var. kersi, pendanga, pitangueira vermelha, Red Brazil cherry, zoete kers. 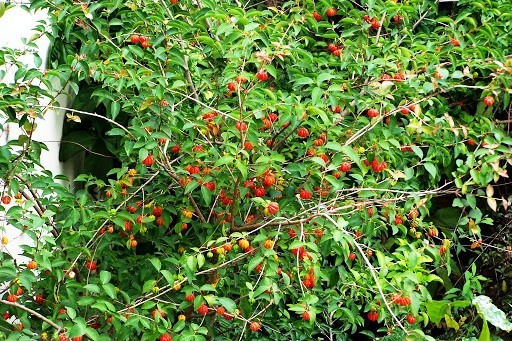 The Surinam Cherry, also called pitanga, Brazil cherry, and in Hawaii, pumpkin cherry, is a large shrub that can achieve heights in excess of 25 feet. It is often referred to as a tree. 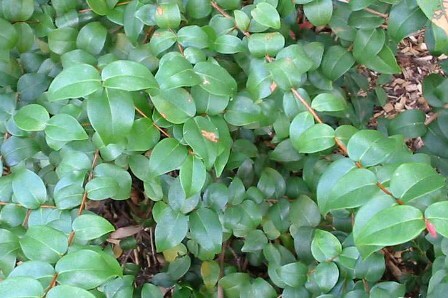 The evergreen leaves, ovate to lanceolate, are slightly bronze colored when young and about 2 inches x 1/2 to 3/4 inches. One to four fragrant white flowers are found together in a leaf axil, each 3/8 inch diameter with an average of 50 stamens. The fruit is thin skinned, 7 to 8 ribs, 1.5 inch diameter with 1 to 3 seeds. The fruit is green when young, turning to orange then to a bright red or dark purple-black. The sweet juicy flesh is considered refreshing by some and an acquired taste by others due to its resinous flavor. A member of the Myrtaceae family, the plant is related to guava, jaboticaba, mountain apple and other members of the genus Eugenia, which includes more than 30 edible species. Chefs chose Surinam cherry as part of the 12 Trees Project because of its versatility for culinary uses, attractive color and unusual flavor. Introduction of the fruit into Hawaii is believed to be prior to 1911. There are two distinct variations found in Surinam cherry, a common red colored fruit and a less resinous dark purple to black, often sweeter fruit. An Israeli cultivar named ‘Gitit’ is untested in Hawaii as are plants from a Brazilian breeding program that identified 3 promising cultivars in 1996. 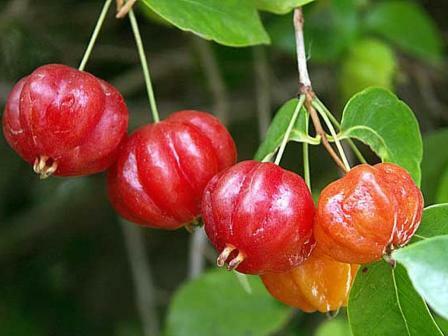 The Surinam cherry is a tropical that can be grown in tropical or sub-tropical regions. It can be grown at sea level, although it is intolerant of salt in the soil, and has been found at elevations up to 5000 feet. The plant has a long taproot and can survive periods of drought. It produces fruit in full sun or partial shade. The plant thrives in most soils but produces more fruit in deep loamy soil. Some seedlings will produce fruit in 2 to 3 years while others will produce in 5 to 6 years. Fruit matures within 3 weeks after flowering. In many parts of Hawaii, fruiting occurs year around when rainfall is abundant. 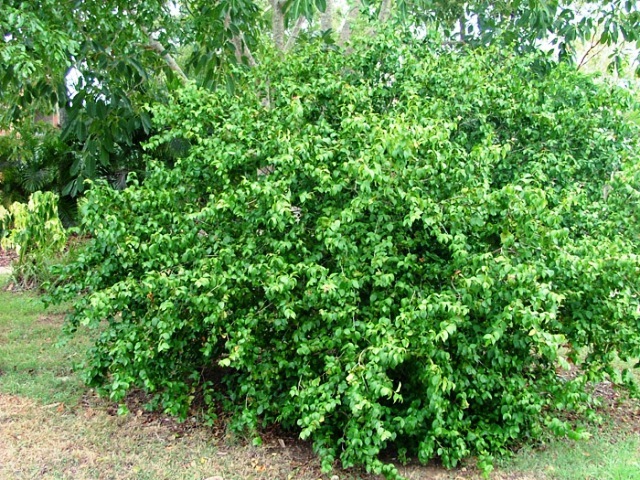 Cultivation of Surinam cherry occurs in many countries. Often planted in rows spaced 6 to 10 foot apart, the shrubs are also planted as hedgerows as close as 3 feet apart. The plant responds favorably to 1/2-pound quarterly applications of organic 6-6-6 and irrigation in dry areas. Regular mulching is advisable. Ten minutes of daily irrigation with a 1/2 gallon per hour emitter helps the plant to create larger and somewhat sweeter fruit. In countries where the cherry is cultivated, no pruning is done until after the first year the shrub has heavily fruited. Pruning dead wood and shaping or lowering the tree to facilitate harvesting is advisable, usually after the 6th or 7th year of growth. The highly adaptable plant also serves as an ornamental and will flourish in locations where other fruit crops are difficult to establish. Surinam cherry is a fruit fly host. Following the Hawaii Areawide Fruit Fly Pest Management Program (HAW-FLYPM) is highly advisable. Scale insects and caterpillars are also attracted to the tree. Twig dieback and root rot, caused by Rhizoctonia solani , often occurs in Hawaii . Other reported problems include leaf spot caused by Cercospora eugeniae, Helminthosporium sp., and Phyllostica eugeniae; thread blight from infection by Corticium stevensii; and anthracnose from Colletotrichum gloeosporioides. The use of safer soap or neem oil sprays and proper care of the tree helps to combat these diseases. Although usually grown from seed, grafting plants with superior fruit does occur in countries where the fruit is commercially cultivated (Brazil and India). Successful air layering is also reported. Numerous seedlings are often found under existing trees, the smaller of which can be easily transplanted. Seeds are viable for about a month and germinate in 3 to 4 weeks. Surinam cherry sold as fresh fruit is generally harvested when fully ripe as the fruit contains more sugar and less resin. Care must be taken not to damage the thin skin. The fruit is edible, somewhat firmer and less susceptible to damage when the color is orange or orange-red, but has a more resinous flavor. Fruit harvested for processing can be picked as soon as it becomes orange. Chefs and jelly manufacturing companies have expressed a desire for fruit at this stage. Ripe fruit should be package in the field in the vented clamshell container in which it will be sold. It should be chilled as soon as possible after harvest. Firmer fruit is also easier to pit than softer fully ripe fruit. Yields from trees in Hawaii can vary from 6 lbs., from a 4-year old tree, to 24 pounds from a 20-foot untrimmed tree in the wild. In India the fruit is harvested once or twice daily with yields ranging from 6 to 8 pounds per plant per year. Israel reports one untrimmed tree producing 2700 fruit in one year, with a total weight of 24 pounds. The average yield from a Brazilian test plot was 15.4 pounds per tree per year. As with most members of the Eugenia genus, the faster the fruit can move from field to refrigeration, the longer its shelf life. Freshly picked Surinam cherry chilled within an hour of harvest maintained its integrity in the produce section of a South Kona supermarket for 14 days. The project Surinam cherry tree produced an annual marketable yield of 12.0 pounds. The average market price was $3.75 per pound, and therefore the tree generated a gross revenue of $45.00 for the year. Growing costs (fertilization, irrigation, pruning and all weed and pest control) amounted to $19.45, and harvesting costs (picking, packing and delivery to market) totaled $29.50. (All labor to grow and harvest the Surinam cherries was assumed to be paid at an hourly wage rate of $16.00, including withholding, FICA and benefits.) Thus, the total annual operating costs, sometimes referred to as “variable costs,” were $48.95. The gross margin (gross revenue minus all operating costs) was a negative $3.95. The Surinam cherry gross margin is the amount of money available to pay all the ownership costs associated with the Surinam cherry enterprise. Ownership costs, sometimes referred to as “fixed costs,” include the value of land used (rent or rent equivalent or mortgage and property taxes), the value of the capital investment (such as the tree establishment cost and buildings and vehicles), the value of the management, and the value of any unpaid labor. (All paid labor is already included in the gross margin.) Ownership costs, unlike operating costs, will vary substantially from farm to farm and will depend largely on how the farming operation is financed and on economies of scale. Each grower will have to calculate his total farm ownership costs and then allocate an appropriate portion of these costs to each enterprise on the farm. Now the profitability of the Surinam cherry enterprise can be determined by subtracting the Surinam cherry enterprise’s share of the total ownership costs from the gross margin for Surinam cherries. The demand for Surinam cherry has increased dramatically during the course of the 12 Trees Project due, in part, to the awareness created by the project with area chefs who were unfamiliar with this common, locally grown fruit, and because of the outstanding recipes developed by the Community College Culinary Arts program. In addition to chefs, Hawaii jelly manufacturers have also requested large quantities of the fruit. In both cases fresh fruit or frozen puree would be acceptable. Fresh fruit packaged for the consumer should be in vented clamshell containers with no more than a double layer of fruit. Packed fruit should be even colored and inspected carefully for defects and possible infestation. Fruit that leaks juice should be discarded or kept for processing. Fruit harvested for sale to processors should be washed. Seeds and stems should be removed prior to processing into puree with a commercial juicer. Puree for sale to chefs and manufacturers should be processed in a commercial kitchen as required by the State Board of Health. In some cases chefs will prefer to purchase fruit that is been cooked and strained but not pureed. During the first 2 years of the 12 Trees Project the retail price of Surinam cherry jumped from $2.00 per pound in 2003to the 2005 price of $3.50 a pound. Wholesale prices to groceries and wholesalers jumped from $1.50 to $2.50 per pound in the same period. Health Benefits- A good source of vitamin A, vitamin C, iron and iodine. It is an antidiarrhoeic. Surinam cherry also has substantial amounts of the antioxidant lycopene, beta-cryptoxanthin, gamma-carotene and rubixanthin. The seeds are reported to be toxic to some people and should be avoided.